Dad. Grandpa. Son. Uncle. Brother. Friend. Talk to his kids, grandkids, mom, nieces, siblings and friends for five minutes and you’ll find out how beloved Bruce Singleton is. You’ll see their eyes light up as they recall his spiritual advice, loving patience, brilliant way with words, wildly witty texts, magical way with a guitar, and endless good humor, even in the face of adversity. Bruce is 62 years young, especially at heart. He was diagnosed with idiopathic Pulmonary Fibrosis (IPF) in 2016. His early symptoms were a troubling cough and shortness of breath. He’s the type of guy that would never want you troubled by his condition. He’s more interested in how you’re doing as the doctors and nurses tending to his care learned during visits when he’d bring the team treats and shoot the breeze during assessments. A year ago, his symptoms worsened. Despite his avid attention to staying healthy and doing all he could to maintain his lung health level, his doctors determined that Bruce needed a lung transplant. As of February 3, 2017, Bruce is now on the list for new lungs and a new start. What a blessing! Bruce and his family and friends feel so blessed to have this opportunity to live! More time with his adorable grandsons Adrian and Cameron, who rely on him to play horsey, share cookies under tents and read them stories. More time to watch his children, Amy and Matthew thrive in their lives. More visits with his two brothers and sister who rely on him for his wisdom and unique sense of humor. A chance to have fun dinners with his 88-year-old mother and help live out her final years in peace, with her family healthy and intact. And more music and laughter with his oldest and dearest friends who are family. The costs associated with transplants can be overwhelming. Even with insurance, there are co-pays and deductibles, medications and doctor visits, and important therapies and treatments to keep him thriving for many years to come. His out of pocket costs could top $30,000. Bruce has spent his life being the devoted helping hand to others and now he needs your help. Bruce has so much still to do. He misses being active with his close family and can’t wait to race around with his grandsons when he has his new lungs! His family needs the light of their lives. His friends and community rely on the hilarious, wise man who stays on call. Bruce wants to again be that indispensable guy who can fix anything, make you laugh no matter the circumstances, and stop whatever he’s doing to come to the rescue. Let’s help him get back there! Help us spread the word; Share Bruce’s story anywhere you can. THANK YOU FROM THE BOTTOM OF OUR HEARTS AND THE TOP OF OUR LUNGS. We are very happy to announce that Bruce underwent a very successful lung transplant surgery on Saturday May 20! Bruce got the call late Friday night and it was go time! Tests were run throughout the night on Friday night and by morning it was determined that the lung was a good match! The surgery took place Saturday early afternoon and by Saturday evening Dr. Linda Bogar, our brilliant superhero surgeon, came out to tell us that it was very successful left lung transplant! 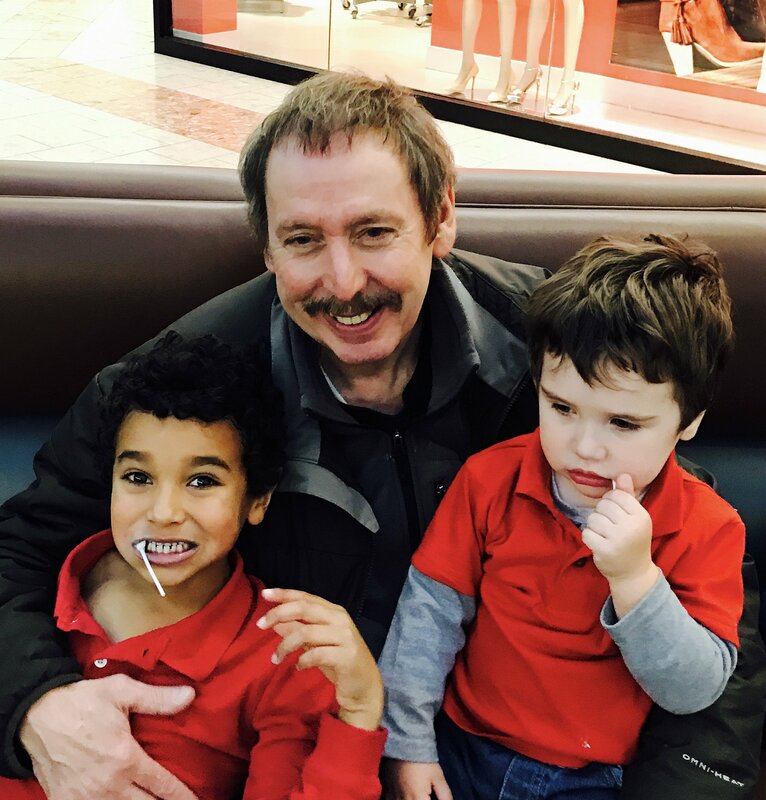 We are so grateful to his doctors and medical team at INOVA fairfax, to friends and family like you, who have supported him through this last year and- it’s hard to express this adequately- to the donor who’s lung will give Bruce a brand new start. Eternal Gratitude. Bruce is recovering at a rapid rate and impressing the amazing staff in ICU with his progress. He is cracking jokes and spreading his positive strong spirit with everyone around him! They will have him out of ICU and on the ‘step down’ floor as soon as a bed becomes available there. One nurse just said “you gotta get out of here because ICU is for sick people and your not sick anymore”. It’s been amazing to see his oxygen levels at 100% with no oxygen therapy! This has been a miraculous experience so far and we cannot thank all of you enough for your thoughts, prayers, good vibes, care, love, and your contributions here on HHL! The surgery is behind us. Now his journey back to health begins! We know with Bruce’s great attitude and all of the love and support from all of you he is on a beautiful path to full health and recovery! We will continue to update you all! Thank you for your continued support! Bruce and family would like to thank each and everyone of you for your loving, caring words and healing thoughts and prayers. Bruce is maintaining a healthy lifestyle and keeping happy and positive due in large part to everyone’s support. He is overwhelmed with the love and support from everyone. Uncle B - My favorite story from other family members is about when I was born. You were in the waiting room telling jokes and everyone remembers how fun and high spirited you are. Now, clearly I don't remember that. What I do remember is seeing you after I woke up in the hospital in '07. I also remember you being there when I broke my leg in '13. You have always been a rock for me. It's my turn to be a rock for you. I love you so, so much. Xo. Bruce, I am a student of your brother, Dave. He has helped transform my writing and encouraged and inspired me. It is a privilege to give back. I hope that you will draw strength from the many people who are praying for you and supporting you. Hi Bruce, I am a friend of Laura's. She speaks of you often with the kindest words. I'm wishing you health and happiness. If anything, this write-up actually may be a tad understated. My dear friend, landscaper, handyman, car-purchase-mentor, etc., etc. Bruce usually manages to keep his angelic wings carefully folded and hidden, but sometimes you can catch the light of the Sun glimmering off his halo. I will add you to the top of my own healing prayer list, Bruce, and start submitting your name weekly to the distant-healers at the Center for Spiritual Enlightenment, but I will need your request/permission for any shamanic healing work you might desire (if and when you are ready). Much Love and Light to You Always, Buddy! Bruce is my dearest friend. He is everything this page says, and more! Love you, Bruce! Bruce, We are thinking of you and wishing you all the best in your recovery. Brilliant Bruce, we've got your back. Love you brother. Bruce, I am thinking of you and I am glad that you have the love and support of family and friends. I have mentioned to Dave, that I am happy to help in any way I can, should you need a helping hand. Just let me know. Until then, I am sending you a virtual hug. bruce, you are in my thoughts and prayers!